My friend, Diane Buse, recently returned from Paris with some beautiful vintage jewelry from Chanel. Many of you are familiar with Diane’s “Dash Rocks” jewelry that we sell in our store. 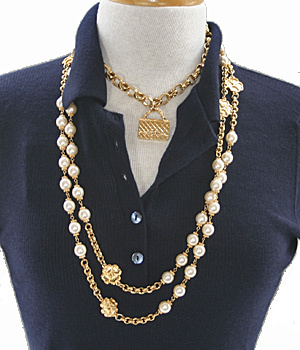 Diane has added a number of vintage Chanel necklaces and earrings to her Dash Rocks line — all are for sale at Isle of Skye Cashmere. In 1983, Karl Lagerfeld was appointed the couturier for Chanel. Shortly thereafter, he hired Victoire de Castellane as head designer of Chanel costume jewelry, where she remained until 1998. Many of the pieces in Diane’s Dash Rocks collection were designed by de Castellane in the late 1980’s and can be authenticated by their oval signature plate with the Chanel logo. Diane has also included several pieces which use pate de verre (poured glass) from the reknowned Parisian Maison Gripoix. Maison Gripoix creates stunning pieces to accompany the runway collections of Chanel, Balenciaga, Lanvin and Givenchy. Only a handful of people know the technique of melting glass into different shades of color as well as transforming the molten glass into pearls, enamel, and crystals… and each piece of this jewelry can take up to 400 hours to make. All of these beautiful Maison Gripoix pieces are highly prized as collector’s items. Please stop by Isle of Skye Cashmere to see the Vintage Chanel pieces and all of the Dash Rocks jewelry created by Diane Buse. If you are looking for a personal signature piece that will turn a good look into a great look, this is where you will find it. I have been wearing my Dash Rocks pearl necklace with all my cashmere sweaters this spring…for me, it brings a little hint of Paris springtime to this dreary cloudy weather we have been having. I’m pretty sure I was born in the wrong decade but stuff like this makes it bearable.